As we age, our bodies start showing signs of ageing as muscle function, healing ability, and blood flow start slowing down. As such, we should be looking at redefining our fitness routines every decade or so, as what worked for our bodies when we were in our twenties and thirties may not be as effective – or even damaging – in our fifties, sixties and beyond. Exercise at any age is essential as it helps to boost our mood and regulate our sleeping patterns as well as improving our strength – and self-confidence. As we age, there are even more hidden benefits such as warding off cognitive decline, memory loss, and dementia. How should our routines change as we age? When we’re in our twenties, our body is at it’s most resilient, so it’s a great time to be more adventurous in our workouts: say yes to every opportunity and trust that we can bounce back from a majority of injuries incurred. In our thirties, most of us become a little time poor, so our choice of what to ‘invest time in’ becomes more specific. Our increased self-awareness through our thirties and into our forties gives added appeal to more meditative pursuits like yoga and pilates. These not only help to strengthen, lengthen and tone the body, but also the mind – a boon for managing the myriad of hats we wear during that phase in our life. Once we get to our late-forties and fifties our bodies and hormones are changing, we begin to lose further muscle mass. Our metabolism slows significantly, and fat starts to accumulate in our midsection. The abdomen is a dangerous place to carry fat because it circulates more fat closer to the heart, which can inevitably lead to heart disease. Our bone density also starts to decrease so this is a perfect time to introduce weight training if it is yet to be incorporated into our routines. Not only does this help to keep us toned and our bones strong, but the muscle we build will also make our metabolism and cardiovascular system far more efficient. By the time we get to our sixties and seventies our strength and muscle tone decrease substantially. Weakened muscles can affect our balance, making us prone to falling and injury. There are many benefits from continuing to exercise, of course, and many find that lifestyle shifts in retirement allow for greater exploration of interested in low-impact forms of exercise like the ballet-inspired barre, golf, swimming, walking, and even water aerobics. If there are mobility issues talking to your doctor to find out what they think is possible is a great idea. Exercising smarter – not harder – is key to avoiding injury. We should listen to our bodies, reassess each decade and choose age-appropriate exercise regularly – three times a week is ideal. Remember: if we don’t use it, we lose it. The pursuit of fitness at any age can be supported by taking a magnesium supplement like Nutra-Life’s Magnesium Forte, to support proper muscle and nerve function, as well as maintaining normal cardiovascular system health. 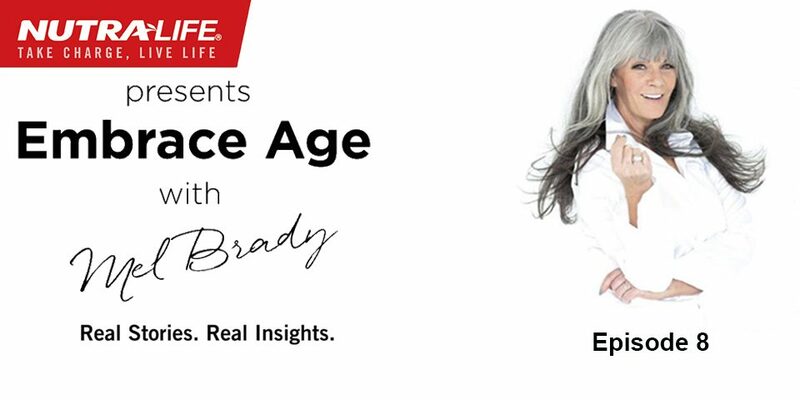 Listen to the full conversation via the Embrace Age Podcast.